Ending and preventing homelessness in every community, one church and one family at a time. 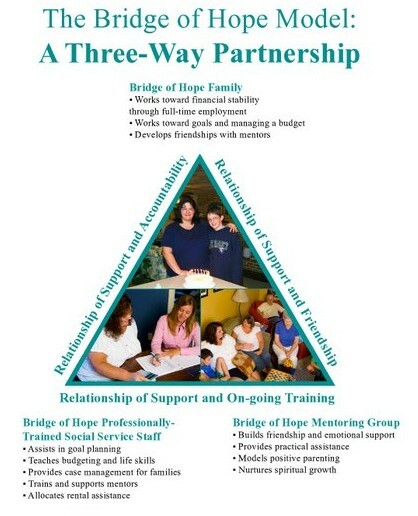 Bridge of Hope brings together professional staff and trained church-based mentoring groups to empower homeless and at-risk single mothers to attain: Permanent housing, Financial self-sufficiency, Life-changing friendships, Growth and wholeness. Search for Bridge of Hope assistance in your state. We believe that the church is the vital link for ending homelessness for homeless women and children; we believe that mentoring groups provide a long-term supportive network for homeless and at-risk families. We respect each woman and child participating in the program, regardless of race, ethnicity, faith and past experience. We draw staff, Board members and mentoring groups from Christian congregations which confess Jesus Christ as divine Lord and Savior. We believe Jesus Christ is our example in bringing love and hope to the poor, the broken hearted, the oppressed, the homeless and the suffering. We support and encourage positive life changes related to physical, emotional, social and spiritual wholeness which may occur in all participants, staff, board members and volunteers through their involvement in Bridge of Hope. We value the staff who provide professional, compassionate and quality services to participating families and mentoring groups. We value honesty and integrity as the operating principles for all who are involved with Bridge of Hope. We recognize our triune God as the life source for this ministry and depend on prayer to empower us to fulfill God’s purposes through Bridge of Hope. Bridge of Hope suggests the ten free things to do with friends. I am desperate to get away from my emotionally (and sometimes physically abusive) live in boyfriend/father of my two sons (13 and 7). I have lost every single thing I own because of him (and I take some ownership). I feel like I have completely died inside. I need help getting out or I’m not sure how much longer I can deal with this. I am a single mother of five there father was killed in 2008 I struggle to take care of my kids even tho I get no ssi for their father being deceased I have now found myself homeless with my five kids and and can’t seem to get no assistant with rent and i was unemployed for the last five months due to me now having a vehicle and i cant seem to get no assistance in indiana why is my ? My name is Rachel, I am in need of help. I am currently 7 months pregnant with a 3 year old. I was just informed the house I just moved into is going up for sale and I have to be gone by August 30th. Can someone help me with any kind of resource please. Iam a single mother and I have my two.year old and haven’t been able to find no housing assistance because I only qualify for a two bedroom and they are all full where I live..my income is not enough to get my own apartment and landlords wont rent to me being is not enough to even support myself or my daughter..I’ve been homeless with my daughter since November 2012 and my mom had to let me stay with her being I was obligated to pay a motel for me and my daughter to stay and couldn’t keep paying for..my mom can’t have me and my daughter living any longer with her because she has section 8 and her landlord threaten her to tell her section 8 worker..I can’t find shelter they’re all full and I was evicted from housing before when I got the letter from department of social. Service stating I would no longer receive cash years ago..now I can’t rent any apartment or even get housing I beleive due to that..what am I supposed to do? I am an unemployed Single Mom of 1 Daughter. I have spent all my life savings and I have sold our only means of transportation just to keep a roof over our heads during this economical crisis. The only income I receive is TANF at an amount barely enough to pay utilities. I have been eagerly looking for employment but, have not been able to find gainful employment. This month, I was unable to make my rent payment and now my Daughter and I are facing an eviction in a matter of days. I cant afford to stay at my present location nor, can I afford to move…because, of no funds, family or help, I don’t have money for a moving truck/moving men.I have household items that are gonna be a challenge for me to left…ex: W/D, deep freezer, refrigerator, ect.,. I have called every kind of organization which claim to assist those in need to find out that there are no organizations which offer moving help to people facing economical hardships or getting evicted or whom may not have the ability to pay for conventional movers & their rates. All profit/ non profit organizations in my area say, that there are no funds available. I do not know where to turn for help. I have called numerous PHA in and near my area to try to get an affordable, subsidized housing, based on income to no prevail…all list are closed or there is a waiting list anywhere from 8 months – 8 years in the Georgia area…I just can’t afford to wait 8 years for affordable housing. I was told by a PHA, (when I called about Public Housing/ income – Based Rental….no section 8 / hcv) to go stay in a Homeless Shelter. Dang are thinhs that bad that the PHA refer needy families to shelters instead of helping them obtain safe, adecate and affordable housing? We (my child & I ) need immediate assistance. I understand that everyone is experiencing hardships in one form or another and everyone finances are tight but, I cant understand that there are no places for families to get or receive help and the only option is to have / leave a family homeless and on the streets. You are not alone me and my kids are homeless at this moment and im just finding employment and not even the shelter in our lil town has room so all this assistance for single parents is where again cause every place i have contacted says they dont help i am so discouraged so you are not alone its everywhere im in indiana and they will help a forner before they help a citizen crazy….